Would you give up your smartphone for 365 days in exchange for $100,000? Vitamin Water is willing to take that bet. The Coca-Cola subsidiary produces vitamin infused water and with a rich parent like Coke, the company can certainly afford seeding this contest. 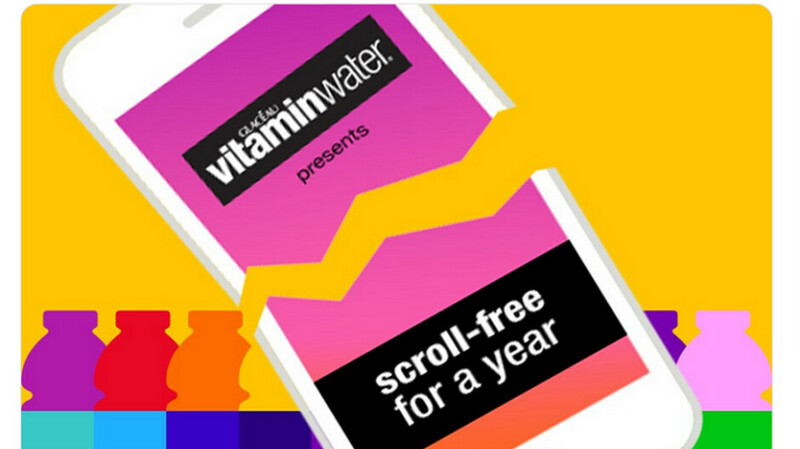 To enter, you need to send a photo to the company's Twitter or Instagram page (@vitaminwater) explaining why you need a break from your smartphone, and what you would do with all that free time you'll have. Vitamin Water says to "go wild, be out there, and wow us." You must include the hashtags #nophoneforayear and #contest. Vitamin Water will choose one participant who will have to give up his or her smartphone in exchange for a old fashioned cell phone that only makes and takes calls. If you are selected and can go 365 days without even holding your smartphone even once, you'll be $100,000 richer. Would you be able to make it without your connected handset for a year? You have from now until Tuesday, January 8, 2019 at 11:59 p.m. ET, to submit an entry. Everyone is allowed to enter as many as four times. And don't even think about cheating. Vitamin Water plans on using lie detector tests to make sure that the lone contestant isn't sneaking a peak at Twitter or Instagram on the sly. Get a small tablet and/or a watch for IM and you’re set. Is this worldwide? I would sold my smartphone off. How will they know that I'm not using a smartphone/tablet? I’m there is a lot carviyard go with it. I can do it easily with without internet for a whole year. Live like the 90s read book watch tv show play intendo exercise etc.... if someone pay me take much yearly I have no problem need the internet. Internet suppose to make life easier and faster but with that kind of money i can afford waste time because I don’t have worry late to work, late on bill etc..... Didn’t i miss out that didn’t have cellphone back then. Jeez, do they really think this is a hard challenge? I can even go 2 years without a feature phone as long as there's laptop or pc. I can do this no problem. This crap ain't televised or publicized is it? I need money but I don't wanna be on some reality TV bs. Lol. Come take my phone. I will put me in a house phone and i am good to go. I could do this. No problem. as long as they don't count the tinkering i have to do with phones at work. They would never approve for me to participate then, I literally have to use a smartphone for somebody every day. You wouldn't believe the amount of people in the world with smartphones that have no idea how to use them lol. "Buys laptop with 4g data and runs an Android VM" No phone. No problem.